Median line study, also known as Andrew’s pitchfork, is a technical indicator utilized by traders, especially stock traders. Andrew’s pitchfork is named after MIT engineer Allan H. Andrew who helped popularize the indicator in the 1960s and 1970s. Median line study is used to identify possible levels of support and resistance for the price of an asset, such as company stock. It is not one of the most well-known technical indicators today and many novice traders are unfamiliar with median line study. Median line study can help you detect opportunities for profitable trading. It is strongly associated with swing trading, but can be helpful when you wish to gouge somewhat longer cycles as well. Median line study involves using three parallel trend lines to identify possible levels of support and resistance. Make three points at the end of identified trends on your chart. (Picking three consecutive peaks or troughs is the most common way of doing this.) We call these points A, B and C.
Draw a line from the first point, and make it intersect the midpoint of the other two points. Add parallel lines that extends to the left from point B and point C.
There should now be a “pitch-fork” on your chart, formed by parallel lines. The line running from point A is the handle of the pitch-fork, and the lines from B and C are the prongs of the pitch-fork. These three parallel lines show the limits of your trend channel, with the B-line and the C-line indicating the levels of resistance and support, respectively. You can read more about applying the pitchfork here. Median line study can be used to seek out good opportunities for swing trading. Buy when the price goes down to a level that is close to the support of either the center trend line or the lower trend line. Sell when the price goes up to a level that is close to the resistance of either the center trend line or the upper trend line. You can also use the levels as a guide for where to place your stop-loss orders. If the price consistently reaches the median line, this indicates a strong trend. Sign of a reversal: Does it look like the price is losing its ability to reach the median line? This can be a sign telling you that a reversal is likely to take place soon. Since you are the one picking the points from which you draw the lines, you will have a big impact on the pitch-fork. It is not uncommon for a price to first drop down to almost the resistance of the center line and then break trough and soar higher. 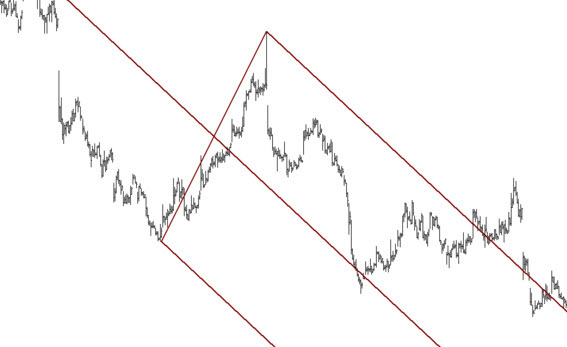 A very steep trend channel is more likely to be broken than a non-steep one. According to Allan H. Andrew’s teachings, the price of the stock he was buying and selling would stay within the channel of the two pitch-fork prongs 80% of the time. If this is true, it means that breakouts will occur 20% of the time.